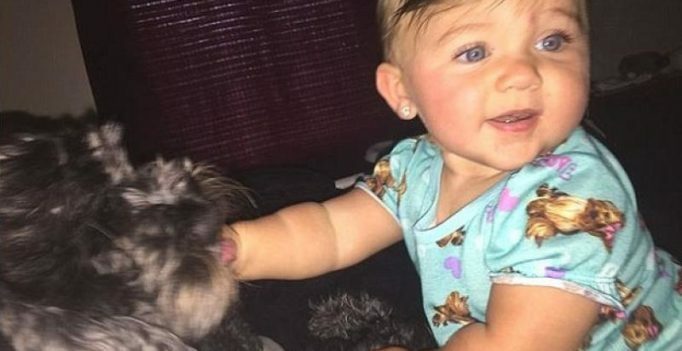 Eight-month-old Viviana Claire was inside a house in Baltimore when her mother Erika Poremski, stepped outside to her car for a minute and when she looked back, the house was engulfed in flames. Baltimore City Fire Department spokesman Samuel Johnson said when crews arrived, the two-storey home had heavy fire and smoke showing from the first and second floors. Firefighters learned the child was trapped on the second floor of the home. Firefighters said when they entered the home on Sunday to rescue Viviana, they found Poremski’s dog, Polo, in the room with her and he was covering her with his body. “She only had burns on her side because of it. He (the dog) stayed with her the whole time in the bedroom and wouldn’t even come downstairs to get out the door,” Poremski told WBAL-TV. “I just heard her crying and I couldn’t get to her. I tried really hard, everyone in the neighbourhood tried. They were kicking the doors in and kicking the windows out. I couldn’t (get her out). Nobody could,” she said. Poremski had burns on her hands and face from when she repeatedly tried to go back into the house to rescue Viviana. Paramedics were able to revive Viviana, who has severe burns on her face, arm and side. But Polo did not survive the fire. “He was my first baby and now I lost him,” Poremski said. “And I’m just praying I don’t lose her. She’s all I have and it just happened so fast, I just don’t understand it. I just don’t know why this stuff happens.” Poremski said her daughter’s condition is still serious and will be monitored day to day.